ApplicationCommandLine - A command-line invocation of an application. ApplicationCommandLine represents a command-line invocation of an application. It is created by Application and emitted in the "command-line" signal and virtual function. The class contains the list of arguments that the program was invoked with. It is also possible to query if the commandline invocation was local (ie: the current process is running in direct response to the invocation) or remote (ie: some other process forwarded the commandline to this process). The ApplicationCommandLine object can provide the argc and argv parameters for use with the Glib::OptionContext command-line parsing API, with the get_arguments() method. The exit status of the originally-invoked process may be set and messages can be printed to stdout or stderr of that process. The lifecycle of the originally-invoked process is tied to the lifecycle of this object (ie: the process exits when the last reference is dropped). The main use for ApplicationCommandline (and the "command-line" signal) is 'Emacs server' like use cases: You can set the EDITOR environment variable to have e.g. git use your favourite editor to edit commit messages, and if you already have an instance of the editor running, the editing will happen in the running instance, instead of opening a new one. An important aspect of this use case is that the process that gets started by git does not return until the editing is done. Creates a File corresponding to a filename that was given as part of the invocation of cmdline. This differs from g_file_new_for_commandline_arg() in that it resolves relative pathnames using the current working directory of the invoking process rather than the local process. arg An argument from cmdline. Gets the list of arguments that was passed on the command line. The strings in the array may contain non-UTF-8 data on UNIX (such as filenames or arguments given in the system locale) but are always in UTF-8 on Windows. If you wish to use the return value with Glib::OptionContext, you must use Glib::OptionContext::parse(char**& argv). The return value is nullptr-terminated and should be freed using g_strfreev(). [out] argc The length of the arguments array. 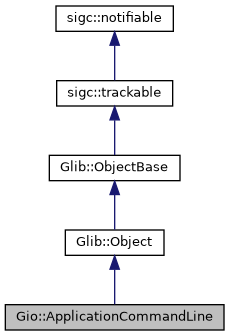 The string array containing the arguments (the argv). Gets the working directory of the command line invocation. The string may contain non-utf8 data. It is possible that the remote application did not send a working directory, so this may be nullptr. The return value should not be modified or freed and is valid for as long as cmdline exists. The current directory, or nullptr. Gets the contents of the 'environ' variable of the command line invocation, as would be returned by Glib::get_environ(), ie as a nullptr-terminated list of strings in the form 'NAME=VALUE'. The strings may contain non-utf8 data. The remote application usually does not send an environment. Use Gio::Application::Flags::SEND_ENVIRONMENT to affect that. Even with this flag set it is possible that the environment is still not available (due to invocation messages from other applications). See g_application_command_line_getenv() if you are only interested in the value of a single environment variable. The environment strings, or nullptr if they were not sent. Gets the exit status of cmdline. See g_application_command_line_set_exit_status() for more information. Gets the options there were passed to Glib::application_command_line(). If you did not override local_command_line() then these are the same options that were parsed according to the OptionEntrys added to the application with g_application_add_main_option_entries() and possibly modified from your GApplication::handle-local-options handler. If no options were sent then an empty dictionary is returned so that you don't need to check for nullptr. A VariantDict with the options. Gets the platform data associated with the invocation of cmdline. This is a Variant dictionary containing information about the context in which the invocation occurred. It typically contains information like the current working directory and the startup notification ID. For local invocation, it will be nullptr. The platform data, or nullptr. Gets the stdin of the invoking process. The InputStream can be used to read data passed to the standard input of the invoking process. This doesn't work on all platforms. Presently, it is only available on UNIX when using a DBus daemon capable of passing file descriptors. If stdin is not available then nullptr will be returned. In the future, support may be expanded to other platforms. You must only call this function once per commandline invocation. Gets the value of a particular environment variable of the command line invocation, as would be returned by Glib::getenv(). name The environment variable to get. The value of the variable, or nullptr if unset or unsent. Determines if cmdline represents a remote invocation. true if the invocation was remote. Formats a message and prints it using the stdout print handler in the invoking process. If this is a local invocation then this is exactly equivalent to g_print(). If this is remote then this is equivalent to calling g_print() in the invoking process. message The text to print. Formats a message and prints it using the stderr print handler in the invoking process. If this is a local invocation then this is exactly equivalent to g_printerr(). If this is remote then this is equivalent to calling g_printerr() in the invoking process. Sets the exit status that will be used when the invoking process exits. The return value of the Application::signal_command_line() signal is passed to this function when the handler returns. This is the usual way of setting the exit status. In the event that you want the remote invocation to continue running and want to decide on the exit status in the future, you can use this call. For the case of a remote invocation, the remote process will typically exit when the last reference is dropped on cmdline. The exit status of the remote process will be equal to the last value that was set with this function. In the case that the commandline invocation is local, the situation is slightly more complicated. If the commandline invocation results in the mainloop running (ie: because the use-count of the application increased to a non-zero value) then the application is considered to have been 'successful' in a certain sense, and the exit status is always zero. If the application use count is zero, though, the exit status of the local ApplicationCommandLine is used.